Chinese people have a long history of using this delicious, crunchy, sweet and refreshing vegetable in their food. You can find bok choy in soups, stir-fries, boiled food and steamed food. There are many different uses of bok choy in Chinese cuisine. Bok choy’s popularity comes from it’s light, sweet flavour, crisp and crunchy texture and also because of it’s nutritional values. A fun fact about bok choy; bok choy is actually a type of Chinese “cabbage” but it’s doesn’t look like a typical cabbage at all. Bok Choy contains some very valuable anti-oxidant chemicals and is high in dietary fiber and vitamins so it’s essentially a superfood that can protect your body from breast, colon and prostate cancers and help reduce LDL (the famous bad cholesterol) levels in your blood. 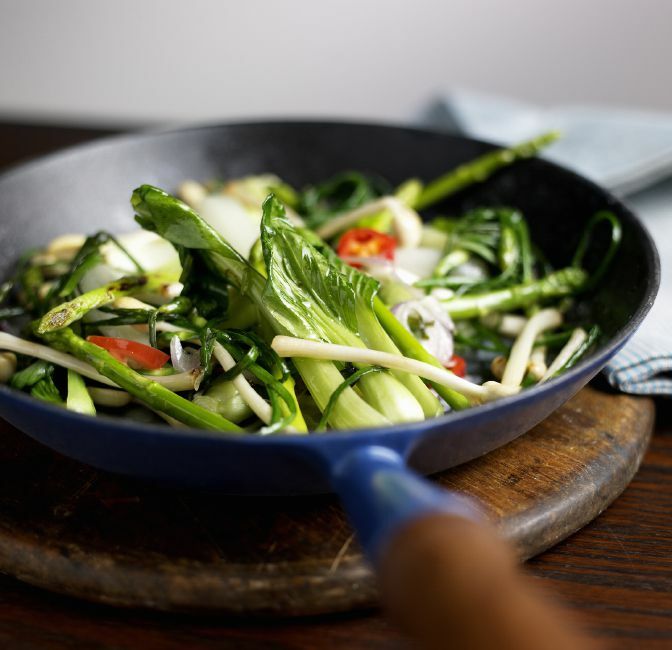 Bok Choy contained lutein and zeaxanthin, which are also antioxidants that can protect your eyes and reduce the risk of age-related macular degeneration. Bok Choy is a very good source of Vitamin K. Vitamin K is well known for helping with blood clotting and helping your body to maintain strong bones and teeth. The nutrition contained in Bok choy is also another brilliant way to help you to cut down the risk of heart disease. Although bok choy was introduced to Europe in the 1800’s and is now readily available in supermarkets throughout North America and the UK, other cuisines have been slow to embrace it. Bok choy is widely popular in the Philippines and Vietnam and has been popular since the 1500s when Chinese immigrants came to both islands following Spain’s conquest in that period. You’ll sometimes find bok choy replacing cabbage in “pancit”, a Philippine noodle dish. It can also be found in kimchi, a Korean hot pickle made with chili powder, garlic and other ingredients. Bok choy, or pak kwahng toong, also appears in Thai recipes however you’re unlikely to see a piece of bok choy in any Greek or Italian salad anytime in the near future. Equally, you’re unlikely to find bok choy soups or salads at your local fast food restaurant. While bok choy has grown in popularity in the United States, parts of Canada and the UK, it remains firmly associated with Chinese cooking. Mention the word bok choy and most of us think of the plant with dark green leaves, however in Hong Kong there are over twenty varieties available. You can also find Shanghai bok choy which has light green leaves as well as baby bok choy, which is a miniaturized version of bok choy found in Asian and Chinese supermarkets. Yet another member of the bok choy family is choy sum or bok choy sum (油菜 or 菜心). Distinguishable by its light green leaves and tiny yellow flowers, choy sum is also known as Chinese flowering cabbage. Grocers normally sell only the trimmed leaves and stalks of choy sum instead of the whole plant. Expect to pay more for it, in the same way that celery hearts are more expensive than a Celery bunch. You may even find choy sum called bok choy sum hearts. In Cantonese, choy sum literally means heart.